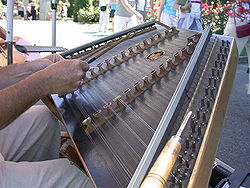 The dulcimer is a shallow box over which are stretched tuned strings that are hit with hammers. It is the link between the medieval psaltery and instruments that would develop into the modern piano. It is mentioned in English literature from about 1400, but by 1700 had become rare. It seems that by 1740 it was only heard at puppet shows and the like. It hung on in Britain into the late 20th century in a modified form as a percussion instrument in school music classes and as an occasional part of street theatre. In eastern Europe it is still a popular part of Gypsy bands and other folk ensembles and, as the “szimbalon” (“simbalon”), has even reached the concert hall. Further east still, (and under various names) it features heavily in the folk music of central and eastern Asia and Iran and in Arab cultures. Incidentally, the instrument referred to as a dulcimer in the Biblical story found in the book of Daniel chapter 3 was likely a wind instrument, similar to the modern bagpipe or the Italian sampogna. This page was last modified on 11 July 2016, at 12:59.